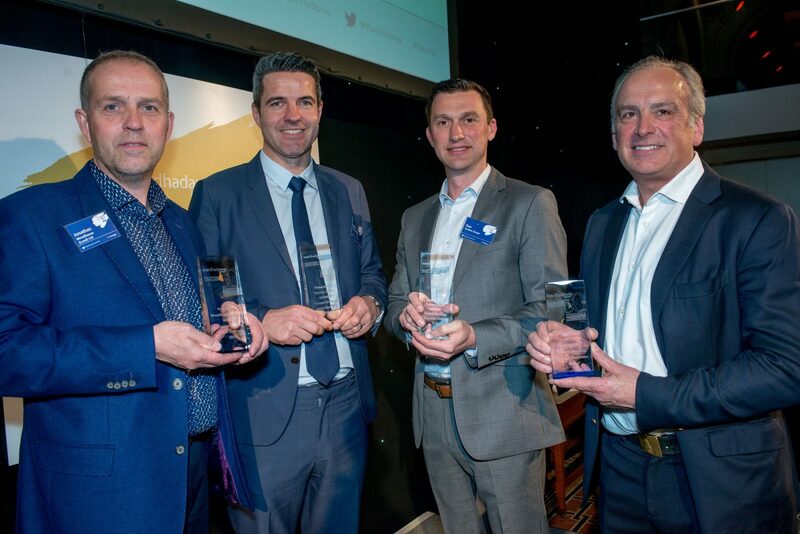 Leeds independent development and construction company, Torsion Group took home a double win at the Ward Hadaway Fastest 50 Awards 2019. The company won the awards for Fastest Growing Large Business and Overall Fastest Growing Business at the event, which recognises and celebrates the fastest growing privately-owned companies across Yorkshire. Established in 2015, Torsion Group has expanded across other regions and now has offices in Yorkshire, the Midlands and the North West and employs more than 80 people. The winners of Ward Hadaway’s Yorkshire Fastest 50 awards at Aspire in Leeds. Alongside it, Torsion Homes, Torsion Developments, Torsion Engineering and Torsion Care were launched under the umbrella brand to fill a gap in each sector. It rose to the top of this year’s list of fast-growing businesses with an average turnover growth of 95.4%. The Group is forecasted to turnover £124.5m in 2019. Dan Spencer, CEO of Torsion Group, said: “We are absolutely delighted to have won the fastest growing business in Yorkshire, especially given the stiff and high quality competition from our fellow Yorkshire businesses! “It is great recognition for the journey we have made over the last four years. It goes without saying that we wouldn’t be where we are today if it wasn’t for our dedicated and hard-working employees who had faith in my vision from day one and who have grown in number from four to 88. Torsion Group won the Fastest Growing Large Business Award – for companies with an annual turnover of more than £25m – ahead of JGB Holdings Ltd in second place and Portland Investment Group in third. Torsion Group was not the only winner at the awards, organised by Top 100 UK law firm Ward Hadaway and supported by The Yorkshire Post. Bedale-based HECK!, won the award for the Fastest Growing Medium-Sized Business, for companies with an annual turnover of between £7.5m and £25m. The family-owned business is thriving since it was set up five years ago. With a team of more than 130 people, the company is on target to turnover £30m in 2019. Founder Andrew Keeble, said: “It is absolutely fantastic to win this award. We started out on our journey all those years ago at the kitchen table, so this award means a huge amount. Everyone in the business will be delighted about this. Second place went to SDH Project Services Ltd and third to Ultimate (Commercial Interiors) Ltd.
Woodhouse (Lund) Ltd was named the Fastest Growing Small Business in the category for companies with an annual turnover of between £1m and £7.5m. The company was founded by Jonathan Walker in 2009 with the aim to build bespoke homes in and around local villages, within easy reach of Lund. Jonathan said: “To win in the Yorkshire Fastest 50 Awards is a great achievement. I feel humbled. I can’t believe what we have achieved in the last few years. As the speaker said you go through times, you wake up sweating in the night about money, but it all comes right in the end if you keep doing it. Second place in the Fastest Growing Small Business category went to SmartSearch, while Consult Search and Selection from Leeds took third. The winning companies and runners up were revealed before an audience of 300 people, including Fastest 50 company representatives and Yorkshire business leaders, at Aspire in Leeds on Friday, March 22nd. The Yorkshire Post’s deputy business editor Greg Wright introduced the awards, which reward profit-making privately owned companies and organisations in the region which have shown the strongest annualised sales growth over recent years. Ward Hadaway Partner Philip Jordan talked about the firm’s involvement in the Awards, Brexit and about Ward Hadaway’s growth in Yorkshire. Top financier Richard Hughes, the founder of Manchester investment bank Zeus Capital, special guest at the event, then gave the keynote speech. In his speech, Richard spoke of how business is about mistakes, not just about successes. He acknowledged the rollercoaster ride that entrepreneurs like those in this year’s Yorkshire Fastest 50 list, go through to reach the top, before moving on to talk about his own journey. He pointed towards social media as causing considerable change in culture and society. He added that any great business is about a team of exceptional people, but it’s also about the one person at the top who drives it. Richard also hinted at his background as being one of the reasons for his success. He said: “I’ve been driven by a fear of failure and that’s because I didn’t do very well at school and therefore I wasn’t an accountant, I wasn’t a lawyer, so I had no professional qualifications to fall back on and therefore I have hunger. “The only thing you can’t teach people is hunger and I don’t know where it comes from or why people have hunger. What I do know is that to be successful you need a strong family around you generally because you can’t have problems at home and be good in business. You need good friends who support you through the good and bad times. He then went on to talk about the tech scene in the UK. Richard ended his speech with a few words of advice for the Fastest 50 businesses in the room. He said: “Whether you’re first in the list or 1000th in the list, it really doesn’t matter it’s still a phenomenal achievement that comes at a great sacrifice, so please enjoy the journey.